The Lee Pantry began in 1991 when the Community Emergency Needs Resource Center (“The Lee Pantry”) was established and located at St. George’s. St. George’s parishioners organized and ran the pantry, with the help of other churches and organizations, who staff the pantry each Saturday morning. In 2010 the people of St. George’s began to worship with the people of St. James at Crissey Farm in Great Barrington. In 2010 and 2011 St. George’s sold their properties. The people of St. George’s wanted to continue to operate the Lee Pantry, so it was moved to the Airlodi Building in Lee. 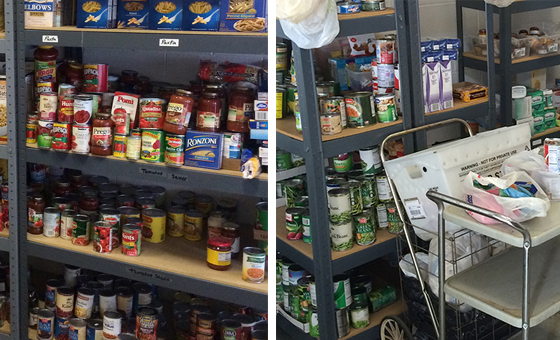 When St. George’s and St. James consolidated in 2013, the Lee Pantry became a mission of Grace Church. It now serves about 50 families per week. You can make a donation to The Lee Food Pantry through PayPal. 100% of all donations go directly to the purchase of food for people in need.